JVVNL Syllabus:- Candidates who have started the preparation of JVVNL Helper Second Exam 2018, We have suggest for them that the Jaipur Vidyut Vitran Nigam Ltd has been upload the JVVNL Helper 2nd Syllabus 2018. We have provide the complete info regarding it. Contenders can access RVUNL Helper Syllabus & Exam Pattern also. So for more updates tuned here. Update 17th Dec 2018:- The JVVNL ready to conducting the Helper 2 Written Exam from 26th December 2018 to 3rd January 2019. Currently, 3.74 Lacs candidates are registered for the 2412 posts. Written Exam will conduct on approximate 73 Exam Centres across the state. The Jaipur Vidhyut Vitran Nigam Ltd now release the JVVNL Helper Second Syllabus 2018. Aspirants can access the Helper Second Syllabus 2018 Subject Wise. 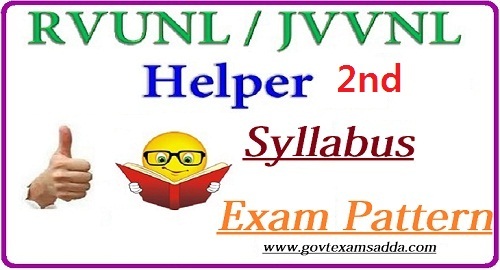 The JVVNL Syllabus Pattern help in the exam of Helper. The Board has been upload JVVNL Recruitment Notification 2018 through which you can fill the application form and start their exam preparation to crack this exam. We have provide the RVUNL Helper 2nd Syllabus 2018 PDF for all the subjects. We have provide subject syllabus like as General Awareness & Technical Knowledge Skill and many more. So you can just click the link and access your AVVNL Helper 2nd Exam Pattern 2018 PDF. The recruitment department releases 2089 posts for tech helper. Candidates also aware the Exam marking Scheme, Exam Duration etc. It is essential for the applicants to join in the written exam. We have suggest to all candidates that they must read the 10th class subjects. The Recruitment authority will prepare the written exam paper form the given JVVNL Helper Exam Pattern & Syllabus. You can focus on the JVVNL Previous Year Papers also. Department Name:- Jaipur Vidhyut Vitran Nigam Ltd. Question paper will be in Hindi and English language. Question paper shall consist of “OBJECTIVE TYPE QUESTIONS” (multiple choice questions –MCQ) with four options of answers. Each question will carry one mark. All texts/questions except general Hindi and General English will be bilingual. Gen. Awareness Xth Standard Gen. Science, Hindi, English, Elementary Maths & Gen. Knowledge with special emphasis on Rajasthan. 100 100 2:00 Hrs. Agriculture & Economic Development of Raj. Applicants, we have given above complete exam pattern & AVVNL Helper II Syllabus 2018. We have inform to all that they can start their exam preparation by which they can secure their selection. After the official announcement we have update JVVNL Helper 2nd Syllabus 2018 also. If you have any query or doubt than you can comment us. 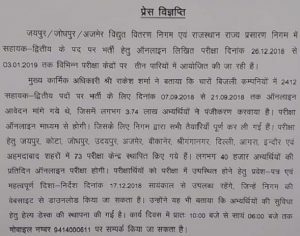 Ujjwal ji rsrtc m vacancy niklengi ya nahi pata ho to bata dena. Jald hi technical Helper Exam Hogi. Dear sir mathmatic m konsi excrise aygi jvvnl technical helper m.
23 august 100% confrm h bhaiyo..
Hello Sandeep Exam online Hoga, Aur Negative Marking bhi h.
Sir helper 2 ka syllabus kya h?